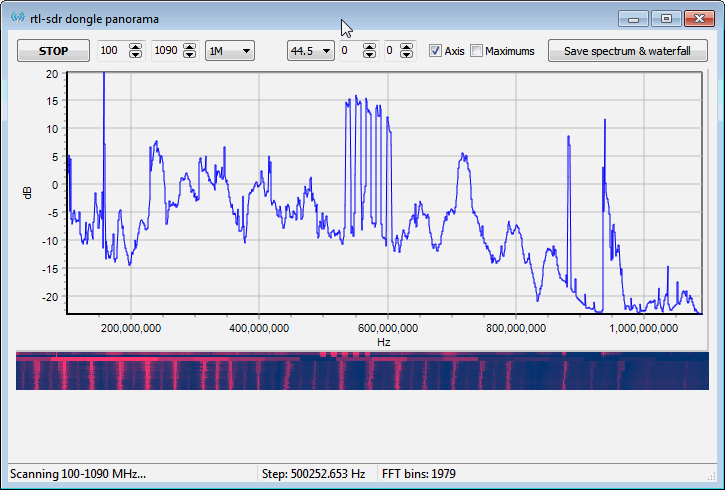 Rtl_power is a command line program that can do a very wideband frequency scan by quickly tuning through 2 MHz chunks of bandwidth and recording radio power values. Now a new GUI frontend for Windows rtl_power called rtl panorama has been released which simplifies the use of the command line tool. To use it download rtlpan.exe from the sourceforge page and then copy the rtlsdr.dll, libusb-1.0.dll and rtl_power.exe files from the official Osmocom librtlsdr download to the same directory as rtlpan.exe. You can hover over each of the controls to see a tool tip explaining which each button does. Recently a similar rtl_power GUI was released and shown in this post. There is also the more featured python based RTLSDR Scanner that is not based on rtl_power which does a similar job. However, the rtl_power based GUIs appear to be much faster at scanning. New rtl_power GUI called rtl panorama. i got the same error, but eventually the file was created and it run without problems. it saves all the scan values in that file. I followed the instructions above to install RTL Panorama and wen I start the scan I get the following error message. “Cannot open file “C;\users\Douglas P. Besemer\Desktop\rtl-sdr dongle panarrama\scan.csv”. The system cannot find the file specified.” I am running Windows 10 64 bit version and have selected the 32 bit version of this program to install. There was no instruction to install a scan.csv file.